This is my Internet speed test 3rd Evaluation of my HughesNET Gen5 satellite dish. The results of this latest eval show a rather drastic speed decrease when compared to my previous two HughesNET evaluations, but I think these latest test results are the most realistic. In my previous two evaluations I used several speed test programs — Speedof.me, TestMy.net, and Bandwidth Place. I thought that averaging the results from three programs would be more accurate than from just a single speed tester. Now I don’t think so. I noticed wildly different results, and some test programs always seemed to skew high. 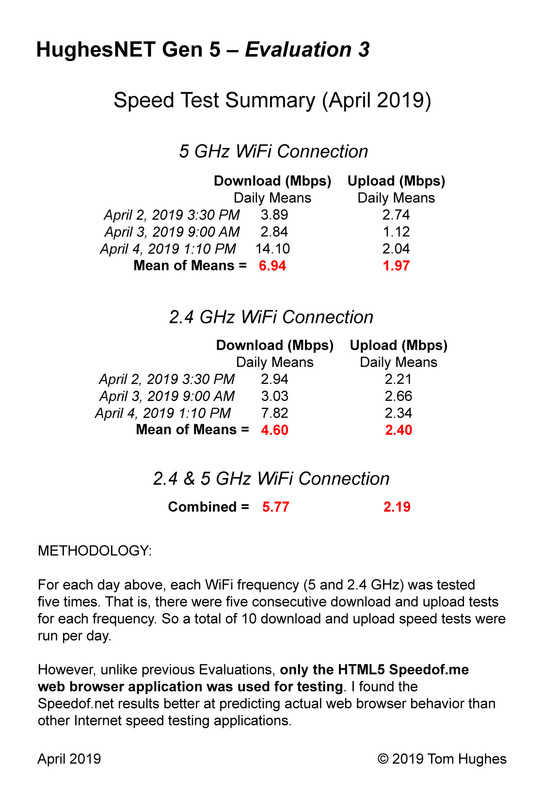 For example, Ookla’s highly recommended Speedtest application yielded contradictory results: it came up with higher speeds for my HughesNET Gen 5 than for the actually faster campground WiFi (see attached PDF for my raw test results). After some research, I settled on using just a single Internet speed tester: Speedof.me. To me Speedof.me’s methodolody (see “How It Works”) more accurately predicts actual web browser behavior than other Internet speed testers. While download and upload speeds are very important, there are other considerations. One of those is ease of use. I’ve been able to set up my .98M dish HughesNET system in about half an hour. It’s actually easier to aim than my DISH satellite TV. Finally, I can live with my latest download speed findings of about 6 Mbps. It’s dependable and allows me to stream video in the middle of the desert.